Reading and share top 11 famous quotes and sayings about Acolyte by famous authors and people. Browse top 11 famous quotes and sayings about Acolyte by most favorite authors. 1. "She drew others to her like acolytes only for them to discover she wasn't recruiting." 2. "Prominence is cool, but when the delusion kicks in it can be a drag. Especially if you choose to surround yourself with friends and not acolytes." 3. "We breathe too fast to be able to grasp things in themselves or to expose their fragility. Our panting postulates and distorts them, creates and disfigures them, and binds us to them. I bestir myself, therefore I emit a world as suspect as my speculation which justifies it; I espouse movement, which changes me into a generator of being, into an artisan of fictions, while my cosmogonic verve makes me forget that, led on by the whirlwind of acts, I am nothing but an acolyte of time, an agent of decrepit universes. (...)If we would regain our freedom, we must shake off the burden of sensation, no longer react to the world by our senses, break our bonds. For all sensation is a bond, pleasure as much as pain, joy as much as misery. The only free mind is the one that, pure of all intimacy with beings or objects, plies its own vacuity." 4. "From a social perspective, I am looking for friends, not acolytes." 5. "Interesting Avil, the priests and the acolytes of the various religions and temples of Torea build their whole lives on a lie. At first, as children they believe it. Maybe as they grow older and more wise they see the absurdness of their beliefs, but by that time they have invested time and emotional energy into those beliefs, then seeing them crumble and fall apart would be too hard for them to bear. So the protect the lie, they shore it up with more lies and they ebb out their short lives, knowing what they preach is untrue, but preaching it all the same... Almost as if preaching it hard enough will make it true... Are they trying to convince their congregation? Or themselves? You are wiser than you look Avil. "~Brael Truthseeker of House KrazicDeathsworn Arc 2 : The Verkreath Horror"
6. "... if hanging with other vamps means I have to go the whole movie cliché route, then forget it. Cemeteries? Acolytes? Partying in chilly mausoleums? Yuck-o. Also, nobody wears a tux this time of year unless they're going to a wedding. You look like an escapee from the set of Dracula Does Doris." 7. "In sport the mind serves as the acolyte and apprentice of the body. Nothing interferes with the flow of the game more than the athlete who obsesses about his every move on the court. You move, you react, you recover, you drive, and the thinking is seamless and invisible in the secret codes of your game." 8. 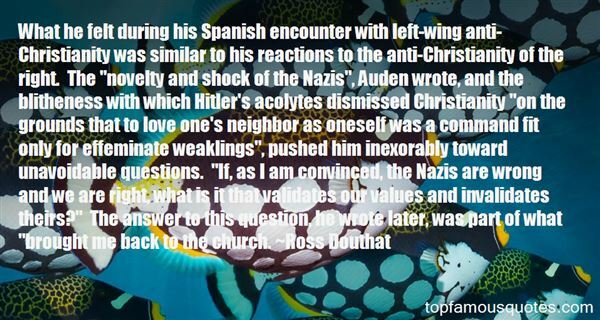 "What he felt during his Spanish encounter with left-wing anti-Christianity was similar to his reactions to the anti-Christianity of the right. The "novelty and shock of the Nazis", Auden wrote, and the blitheness with which Hitler's acolytes dismissed Christianity "on the grounds that to love one's neighbor as oneself was a command fit only for effeminate weaklings", pushed him inexorably toward unavoidable questions. "If, as I am convinced, the Nazis are wrong and we are right, what is it that validates our values and invalidates theirs?" The answer to this question, he wrote later, was part of what "brought me back to the church." 9. "He climbed into bed himself and kissed his way up her legs. Instincts she didn't even know she possessed made her clench her thighs together. Without any hesitation, he pushed them apart, exposing her to his gaze. "The doors of the temple, darling, never close to the devout acolyte." 10. "To be a devout reader was to be an acolyte of solace." 11. 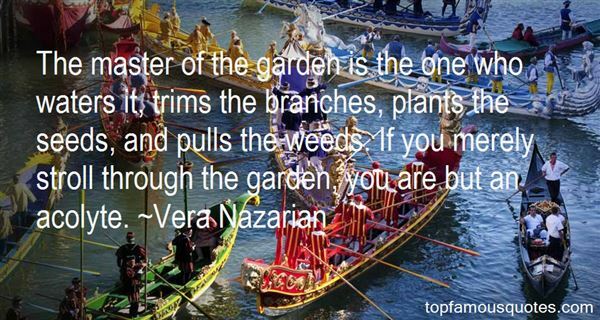 "The master of the garden is the one who waters it, trims the branches, plants the seeds, and pulls the weeds. If you merely stroll through the garden, you are but an acolyte." It's about 65 degrees, so it feels like when the air conditioner is up on high. I can bear it, so I'm going for a walk. Today. Right now. In the sunshine. Because I can.Because I want to. Because I'm not going to just sit around and wait for stuff to happen anymore. I'm still me, and I have a life. It's a weird life, but it's still mine.It's still mine."